It is claimed that an interprofessional approach to health care aims to provide optimal client care, reduce duplication of services, address gaps in service delivery and prevent adverse consequences to patients. Hence there is widespread international interest in interprofessional education in undergraduate programs. However, after employment in the Australian health care workforce, there is limited opportunity for this. The continued education and training of health professionals and other care workers frequently occurs in a climate where professional development is dominated by the existence of professional demarcations. In order to enhance interprofessional collaboration in health care practice and education, mechanisms to guide individual performance within a multi-professional health team are required. 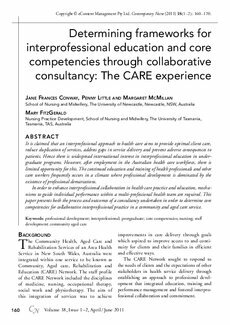 This paper presents both the process and outcomes of a consultancy undertaken in order to determine core competencies for collaborative interprofessional practice in a community and aged care service.